Oscar Wilde, the gastropub, has the longest continuous bar in New York City, at 118.5 feet. There’s a cocktail and spirits list almost as long—such that if we lived or worked in the neighborhood, we’d be tempted to head to the bar every day after work and work through the list. The restaurant celebrates the acclaimed Irish writer (1854-1900). The venue should become a tourist destination for literati. 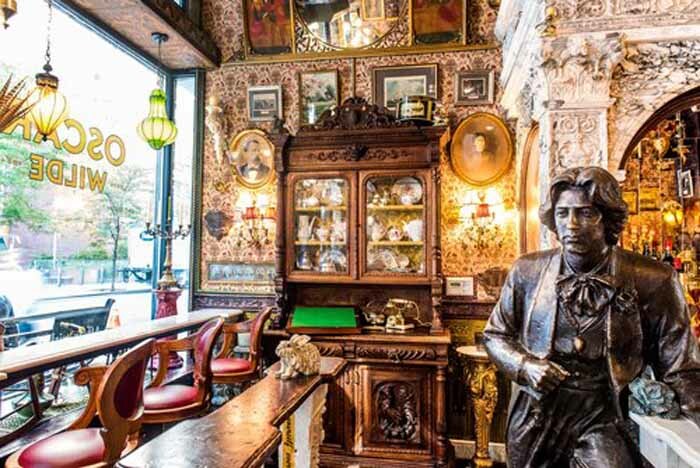 If you don’t foresee a trip to Dublin to see the stunning Oscar Wilde Memorial Sculpture in Merrion Square in Dublin, then Oscar Wilde restaurant in New York City is an opportunity to capture yourself with bronze Oscar Wildes. There are two photo ops with Oscar: one inside with a standing bronze (photo #1), the other outside, seated on a bench (photo #4). These bronze Oscars are even better photo ops than Real Oscar’s tombstone, a popular destination in Père Lachaise Cemetery, Paris. It is beautiful piece of modern sculpture, but not an image of Wilde (and now, it’s surrounded by a glass wall to keep [more] people from further defacing the monument with lipstick kisses). But back to the gastropub Oscar Wilde: The interior is a showplace. One expects to see a motion picture or period televisions series in production. An almost incalculable number of artifacts have been gathered—clocks, marble mantles, fireplaces, carved columns, candelabra, chandeliers, lamps, statuary, paintings, prints, newspaper holders, painted/stained glass, objects d’art. They cover almost every inch of wall space. You can photos of the rooms here.. The eclectic furnishings look like they may have been a part of Wilde’s milieu—and many could have been, gathered throughout the U.K. and Paris. Others come from points around the globe. The Victorian-style wallpaper was handmade in Mexico, some hand-carved marble is from Vietnam. An Irish Writers Wall pays homage to the other greats: Beckett, Joyce, Shaw, Yeats, etc. While you may have stumbled back into Victorian England visually, don’t expect a corresponding bill of fare. Oscar Wilde’s food menu does feature traditional dishes such as cottage pie, striped bass, moules frites and Skellig cheddar from Ireland (on a grilled cheese sandwich). Have a drink with Oscar: a great selfie opportunity (all photos courtesy Oscar Wilde restaurant). 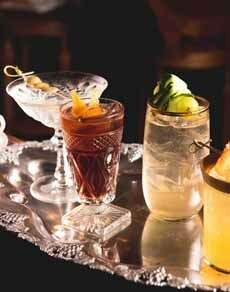 Specialty cocktail menus include both Victorian and Prohibition favorites. Broccomole: broccoli purée mixed with guacamole. A hit! We tried just a few items; each was excellent. New to us was broccomole—a relatively new creation you can find online, but we’d not previously seen on a menu. 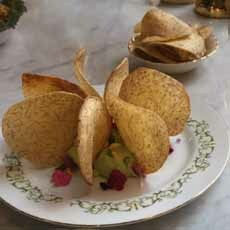 Broccoli is puréed into guacamole, served with taro chips: a great marriage of ingredients. Oscar Wilde is located at 45 West 27th Street, between Broadway and Sixth Avenue. It’s open from 11:30 a.m. to 2 a.m., 7 days a week. There’s a private events room. Phone: 212.213.3066. 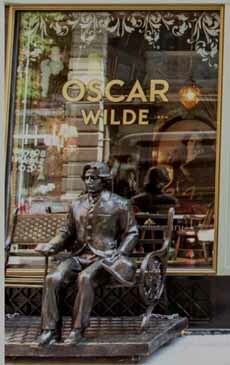 Have a drink with Oscar, at Oscar Wilde’s in New York City. Irony: In 1919, following the Volstead Act, the building became Prohibition Enforcement Headquarters. It was later discovered—purportedly—that the federal agents’ phones were bugged by the mob.